"Zulu" was one of the most exciting films of 1964. Now "ZULU DAWN", a multi-million dollar new film shot on location in Africa, has even greater spectacle with over 12,000 'extras' playing Zulu warriors and British soldiers in the epic battle scenes which stretch for two miles across the landscape. PETER O'TOOLE stars as General Lord Chelmsford, the man who is out to gain personal prestige by slaughtering the Zulu nation, with BURT LANCASTER as Colonel A.W. Durnford, the heroic officer whose courageous leadership is resented by Chelmsford. "ZULU DAWN" is the story of a battle. Set in 1879, the British forces under Chelmsford challenged the might of Cetshwayo, King of the Zulus. His center column which had advanced from Rorke's Drift, was encamped near Isandhlwana. In Chelmsford's absence on reconnaisance, the camp was left in charge of Durnford when they were surprised by a Zulu army nearly 25,000 strong. The British fought valiantly, but were massacred. "ZULU DAWN", directed by Douglas Hickox, is a realistic reconstruction of the greatest victory in the Zulus' history for which the film-makers constructed a complete town in the heart of Zululand. 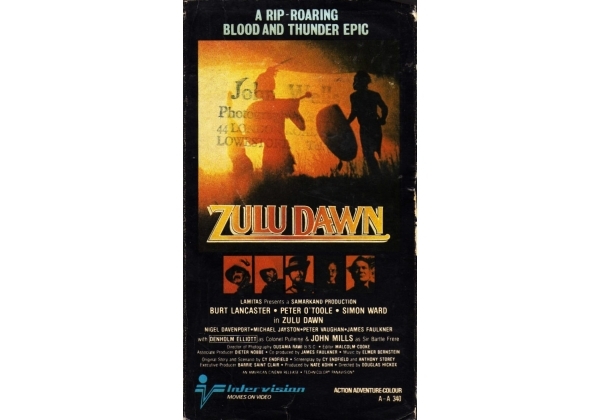 Or find "Zulu Dawn" on VHS and DVD / BluRay at Amazon.